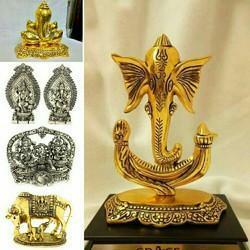 We are one of the leading trader of a wide range of Silver Idols. These are fabricated using quality raw material. Further these can be availed at market leading price. German Silver Gold / Silver Plated God Idols. Buyers can rest assured; the delivery of consignments will be done within the stipulated time. Our products can be ordered in bulk as well as in retail. Our pool of professionals keep close eye on the quality of the products so as to deliver the best in class range. sree krishna idols coated with 925 pure silver. Inside wax. Single and bulk orders accepted. Delivery all over the world. Delivery charges extra. Actual price is 1200. Now offer price is 799. We bring forth for our clients superior quality Silver Sculpture. These Sculptures are highly demanded in the market. These Silver Sculpture are available in various designer patterns and designs. These are available in various types and we offer at market leading prices. 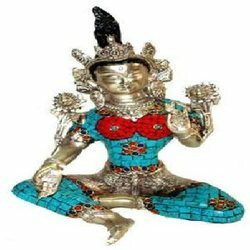 We are offering Ambika Silver Statue to our clients.